What do I have to do to make you embrace the beard, Tom? Do I have to buy a bottle of Tobacco Vanille? Okay, you talked me into it. Ombre Leather 16, the new Private Blend inspired by Tom’s 2016 fall runway, is a superbly plush leather. It’s not a rough, tanner’s leather (think Tauer Perfumes Lonestar Memories, or Tom Ford’s own Tuscan Leather), and it’s not a delicate, handbag suede (Cuir de Lancome, Bottega Veneta). Ombre Leather 16 is a sofa leather, as smooth as the finest leather upholstery. Other notes listed include violet leaf, jasmine sambac, and cardamom, but they keep their heads down; it’s really all about the leather. Is Ombre Leather 16 worth $225 for 1.7 ounces? Only you can make that call. Does it smell like it could be? I have to say it does. Disclaimers: This post is not sponsored and does not contain affiliate links. I tested Ombre Leather 16 at my local Nordstrom. The party’s not until November 5, but today is the actual one year mark for Arielle Shoshana. When I open the shop this morning, I’ll see your faces smiling at me from the Polaroids on the shelves. I’ll see the cash register that my mom manned for seven straight Saturdays after we opened. I’ll see the shelf lights that my dad spent hours soldering into place. I’ll see the exquisitely organized drawers that my best friend Daisy came all the way down from New York to help us set up. I look at the shop that they and you and I have kept open for an entire year, and I feel completely overcome. 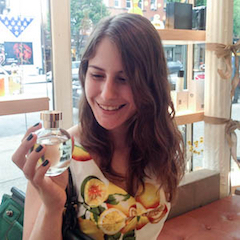 Thank you to each and every one of the 1,483 people who’ve chosen a fragrance at Arielle Shoshana in the last year. Thank you for proving that D.C. was ready to smell more interesting. Thank you for the utter privilege of getting to meet you and talk with you and sniff with you. Today and every day, I feel so, so lucky to have you.